Tomb of Abdul Gaffoor Masthan near where the Refai Ratheeb is performed. An annual event at Dafther Jailany during the annual mowlood and ratheeb in the month of Rabi Ul-Akhir is the Refai Ratheeb, conducted by a group of fakirs. They have a separate room by the side of the tomb of M.R. Abdul Gaffoor Sahib, a mendicant who lived for many years in the Rock Cave at Hituwangala, spending most of his time in meditation. The main organizer of the Ratheeb was the late O. M. Ziyad Hajiyar of Dharga Town and Mr. M. Wadood Hajiyar, a well-known businessman of Gintota, Galle. The ceremony by the fakirs is held in honour of the 12th century saint of Iraq, Sulthanul Arifeen as Seyed Ahamed Al Kabeer Hassanur Riffayee, himself a disciple of the Saint Saiyidena Abdul Qadir Jailany. The head of this sect is His Holiness P. Yoosuf Koya Thangal of Androth Island. The Refai Order originated in the delta of the Tigris and Euphrates rivers in Iraq in the 12th Century AD. 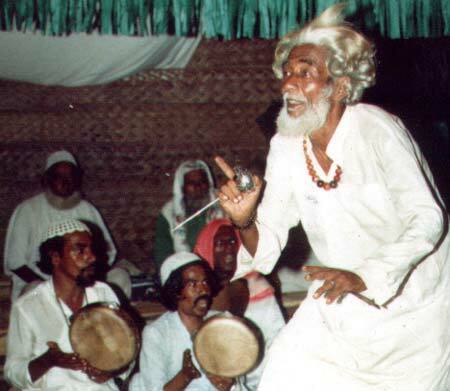 Bawas or fakirs are Sufi mendicants who visit Muslim villages beating tambourines and reciting devotional songs—they wear turbans and beads around their necks and carry begging bowls. They are organised into chapters with a leader known as a "khalifa". In Sri Lanka, they are concentrated in Eravur, Sainthamaruthu, Akkraiapattu, Kalmunai and Ottamavadi. They have a secretary (nakiban), sergeant-at-arms (Kottu Waal), commissary (pandari) etc. The Refai tradition of ecstatic devotion is performed in Kerala, Gujarat, Java and even in Macedonia. The Ratheeb starts with the recital of the Fathiha (recital), the Thangal, or the Khaleefa, (religious dignitary) leads the recital of Ratheeb facing rows of devotees seated on mats, some with rabans (or tambourines). The Saint's name is invoked during the recital with frantic cries of ‘Ya Sheikh' and the fakirs slash at parts of their bodies as a part of the recital. The ratheeb proceeds well into the night. The fakirs grow more frenzied as the recital and beating of drums rise in crescendo. It is an interesting sight to see the recital of the Fathiha and the formative invocation of "Lil Assike Fil Hawa Dala hil. La Yasmahu Minkala Mihadil" to the frenzied "Hoo Allah, Hoo hoo Allah" towards the end. Dennis McGilvray writes: "Perhaps the most dramatic gesture I have witnessed during the Refai Ratheeb or Sufi Zikr sessions is the pounding of a distinctive spherical steel spike decorated with dangling hair-like chains into the top of one bawa's skull, sufficiently deep for it to remain upright while he danced around the enclosure. Other acts include the piercing of both cheeks with a single long steel needle, the attempted laceration of the torso with daggers and swords and the perforation of the skin on the back with hooks and barbs." After seeing the Refai Ratheeb, Dr. R.L. Spittel, testifies in his book, Far Off Things, that the act is a form of self-torture while in a state of spiritual ecstasy. "There is no fake whatsoever about them. I closely examined the injuries afterwards. I must confess I would have never believed some of them possible had I not seen them myself," he wrote. Refai Zikr Ratheeb without the practice of self-mortification is also common. 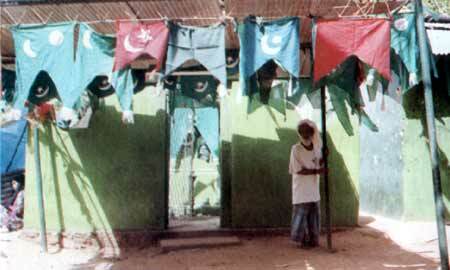 This is performed by Muslim Sufi laymen under the leadership of a Sheikh. This is with two rows of men who sit facing each other and respond to the call of the leader, fervently singing devotional verses in unison, punctuated by sharp beats of their tambourines and executing movements of their head and torso.